Sri Soma Sundaram Challa was born on 1934, in village Mori, Andhra Pradesh. His high school and intermediate education was at Rajahmundry. He obtained BE (Civil Engineering) Degree from Andhra University (Waltair) in 1955. He served in CPWD during 1955-60 as Section Officer, and in S.E. Railway during 1960-83/ in which he rose to the rank of Senior Divisional Engineer. Then, he served in IRCON during 1983-91; he retired from Government Service as General Manager at Ranchi. Thereafter, he served in private organizations company, Rani Construction Company, RITES, Nagarjuna Construction Company Private Limited, and AARVEE Associates in railway, national highway and rural roads projects. During Sri Challa’s childhood, his father used to invite Astrology pundits to the house and gain proficiency in the science of Astrology. Sri Challa used to attempt to read books on the subjects. Later, while studying final years of Civil Engineering at College of Engineering, Kaniknada, he credited a subject on practical Surveying using Theodolite instruments in the field. It is there that he learnt how to estimate the Latitude and Longitude of place, based on observations of angles of elevation of Sun and Moon using Theodolite. And calculations associated with it, using Latitude and Longitude obtained from the Ephemeris. From 1991, he started the formal study of Astrology, with the help of famous gurus at Rajahmundry and Hyderabad. He earned MA (Astrology) Degree from Potti Sriramulu Telugu University in 2006. In 2010, he wrote a book Divadasa Langnamulaku Yogavayoga Nirnayamu in Telugu, which was well received by students and scholars of the science. That book was based on the book of Astrology, Yagavali Khandamu, written by famous astrologer of Rajamundry, Late Sri Vadrevu Suryanarayana Murty. The Present book in English, Jataka Mani Manjusha, Presents the contents of that book as well as that of another book Jataka Narayaneeyamu, also written by Sri Suryanarayana Murty, along with additional items, Satellites Planets and Fundamentals of Medical Astrology. Sri Vadrevu Suryanarayana Murty garu was a famous Astrologer of Rajahmundry. He was born on 8 October 1904 in Vijayanagaram at 1:55pm, and attained moksha on 5 May 1978 at Rajahmundry at 22:10pm. During his distinguished life period 1904-1978, he made special contributions to the subject of Astrology. He wrote a book initially in Telugu in two volumes, the first in 1925 titled Jataka Narayaneeyam in 227 pages and the second in 1945 titled Yogavali Khandamu in 146 pages. For the benefit of non-Telugu readers,he wrote the English version of the book in a single volume with the combinet titled Jataka Narayaneeyam & Yogavali Khandam, in 268 pages. The Citizens Committee of Rajahmundry honoured him on 7 July 1957 by conferring the titled Jyothisha Vidya Bhushana. He was Living in Danavaipeta, Rajahmundry, where my father used to live too. Just then, I had graduated from College of Engineering, Kakinada, and joined engineering service. A brief analysis is given below of the English text authored by Sri suryanarayana Murty garu, which was in the form of running notes. Part I of the book, titled Jataka Narayeneeyam, deals with 16 adhyayas, namely Saungna, Graha Bala, Ayurdaya, Rahu and Ketu Graha Bala, Kalatra, Putra, Matru, Pitru, Bhatru, Shastra, Karma, Raja Yoga, Moksha, Niranika, Stri Jataka and Pretyeka Yoga Adhyayas. Also, it covers Jaimini Jataka Phalas. And, Part II, titled Yogavali Khandamu, deals with Yoga of naturally good and bad planets for the 12 bhavas, baalaarishtam, ayurdayam, and misraphala khandamu. In this part, Sri Suryanarayana Murty garu dealth with the Yoga given by each planet from Sun to Rahu-Ketu for all the 9 planets. While dealing with each planet, he gave examples of various combinations for all the 12 lagnas against the planet and the results there on. 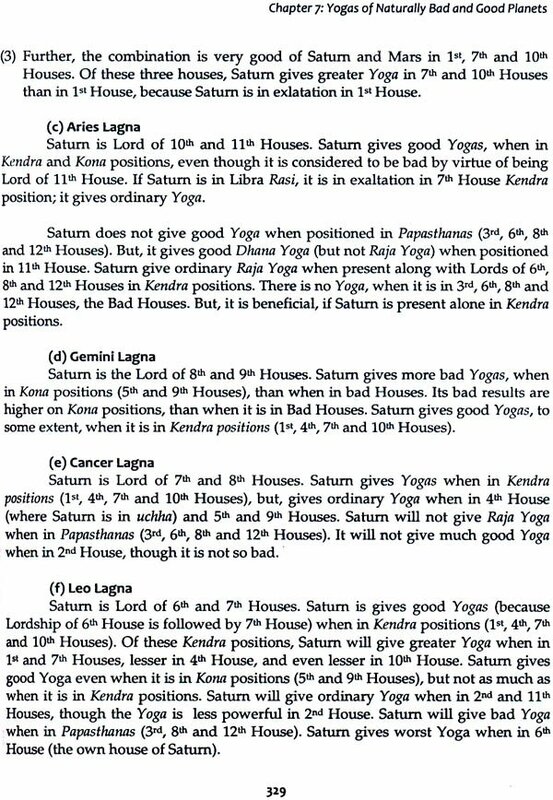 For a student of astrology or for practicing astrologers, the results for a particular Lagna have to be referred to the examples given for various planets at different pages of the book. It is tedious and time consuming exercise unless on is fully conversant with the entire text of 146 pages. Also, it is impractical to remember all the rules laid down therein. This limitation was the motivation of writing this book, with a view to make it simpler and easy to use by students of astrology and practicing astrologers. In this book, all examples and sampradayas given by Sri Suryanarayana Murty garu are re-written to make it easy to understand an Implement the various rules and examples laid down by him. This book has descriptions of the subject for 9 planets and their combinations, lagna- wise separately for each of the 12 Lagnas. This method of presenting the material brings out all the rules and examples given for each Lagna at one single place, with which one can understand the meaning easily. Also the examples are further simplified by presenting their essence in numerical tabular form for al examples are further simplified by presenting their essence in numerical tabular form for all examples given in each lagna. From these tables, an astrology student or a racticing astrologer can readily assess a planet or a combination of planets for the Horoscope being examined, and immediately say whether the planet (whose dasa and antardasa currently running) will give yoga or avayoga, and indicate results of the planets coming at a later date. This book Jataka Mani Manjusha in English covers issues discussed in both the Telugu and English book written by Sri Suryanarayan Murty garu, namely Jataka Narayaneeyam (in Telugu), Yogavali Khandamu (in Teugu) and Jataka Narayaneeyam & Yogavali Khandamu ( in Englis). The same principles of bringing out rules and examples are adopted, but lagna-wise and in a tabular form. The subject is presented in 14 relatively independent Chapters for easy understanding and quick grasping of the subject. Chapter 2 presents with details of Sugnas along with information available on Vedic Astrology in literature. Sketches have been included to give the reader a good idea of the state of the art of astronomy related to astrology; these sketches are adapted from available literature. Further, two special chapters are include, namely Satellites ( as Chapter 12) and Fundamentals of Medical Astrology (as Chapter 13), for the benefit of students of astrology. Invisible planets are called Satellites in Astrological Science, and as Upagrahas in Vedic Astrology. Satellites are powerful and responsible for adverse influence and effects on results of astrology. Descriptions of Satellites are presented along with their effects and results as presented in classical texts like Brihat Parasara Hora Sastram, Phaladeepika, Uttarakalamrutam, and Jataka Parijatam. Satellites influence the fixing of auspicious time for undertaking journeys, purchasing vehicles, matters of money and progeny, and science of horary astrology; they have evil influences on the houses they occupy. 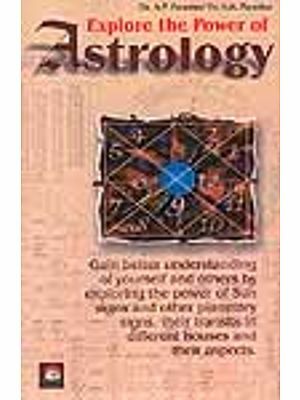 Today, medical astrology is a relatively less developed branch of astrology. No noteworthy research has been conducted in this direction. Medical practitioners are too busy in their professional work, and astrologers seem to have little inclination towards understanding elements of medical science. Therefore, at the outset, it is appropriate to accept that astrological combinations for most of the ailments are not well understood in the present state of knowledge of Astrology. In this book, an attempt is made to explain the basics within the limited understanding. Planetary combinations are identified that give rise to various diseases as given in literature. Sri Vadrevu Sunyanaraya Murty garu, a famous Astrologer of Rajahmundry, wrote a book on astrology in Telugu in 1926 [Murty, 1926], titled Jataka Narayaneeyam. It was found deficient in Sampradayas; he revised it in 1928, and a second time in 1933, to include Jaimini Phalas and many hundreds of Sampradayas. That book is distinctly different from the usual books on astrology. It was based on study of many old books on the subject on palm leaves available in Andhra and Oriental Manuscripts Library at Madras (now Chennai). Also, from his personal experience of studying Horoscopes over several thousands of persons, he included basic principles of astrology, relationships between Planets (Grahas) and Houses (Rasis), and inter-relations between Bhavas and positions of Planets in determining their strengths and consequences. That Telugu edition was reprinted five times to meet public demand [Murty, 1933]. Sri Suryanaraya Murty garu prepared the English version of the Telugu book [Murty, 1933] in 1945 with the objective of reaching ~e subject to a wider audience. Also, in response to readers of the English version demanding greater elaboration of the subject, he authored another book in 1946 titled Yogavali Khandamu as the second volume on the subject [Murty, 1946]. Even this volume was reprinted four times. Later, he combined both the two books [Murty, 1949] into a single edition for the benefit of the English reading audience. In this science (Sastra) of astrology, Sampradayas are primary considerations. In ancient times, Sages taught these Sampradayas to their disciples in person before they started on the underlying principles. Over time, unfortunately, this tradition (and the associated knowledge) has been lost, along with the personal guidance of Sages; today, only the bare principles are available. Fortunately, these Sampradayas are alive in a few families. It is said that any amount of study of the Sastras without the Sampradayas is a fruitless effort. With this shortcoming, even learned Astrologers were unable to explain the rationale behind many principles; some were tempted to offer explanations of the principles, but these were negated by living experience and verification. 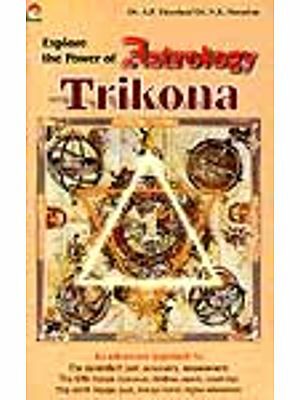 In addition, the absence of authoritative works in this subject of astrology and the neglect of traditional knowledge on astrology by modern Astrologers effectively prevented the development of this Science to its full stature. The science of astrology has three schools of thought, namely Parasara, Jaimini and Sripaihi Bhatia. Unless all these three schools of thought are mastered, the full grandeur of the science of astrology cannot be appreciated. Vrudha Parasara gave a spark of life to this Sastra and his deciple Badarayana added many aspects to it in his vachanas. Poorva Parasari discussed many aspects of the matter. Later, some Rishies, including Gautama, Saunaka, Narada, Bhrugu and Bharadwaja, wrote Samhitas following this school of thought. Later, Jaimini evolved an individual school of thought, based on his enquiries on Parasara background but modifying them in the light of his own proclivities. And, for a period, Sanskrit works on the subject appear to take a view that Sage Jaimini was blowing his personal trumpet in his works to decry the earlier Parasari traditions. It was the proud privilege of Sage Bruhaspaihi in his Sangraha to correlate and verify these two schools of thought both by theoretical and practical expositions, and stressed the additional merits of Jaimini School of thought. Vrudha Parasara bases its prediction on nine Plants only, but Sage Gauihama, a follower of this school, in his Gauihama Samhitha included three extra Planets, namely Mandi, Gulika and Dhumraka, in the list of planets used for predictions. For reasons unknown, Jaimini and other Rishis omitted Dhumraka, and based their results on 11 Planets only. Astrologers that followed, like Sripaihi, Satyachanja and Varahamihira omitted the two chaua grahas, namely Rahu and Ketu, and effectively considered only seven Planets. And, for reasons best known to them, they omitted all differences to the Jaimini School of thought in their Bhruhat Jataka and other works, and adopted the Parasara classification of the twelve Bhavas beginning with Tanubhava. Later, authors (like Kalidasa in his Uttara Kalamrita) reverted to Parasara tradition in preference to the Sripaihi-Varahamihira tradition, which was in vogue at that time. Also, Sage Kalidasa included Mandi and Gulika, and dropped Dhumraka. It is not clear why Sage Kalidasa also did not follow the Jaimini tradition. Even later, authors of Phala Raina Mala, Jatake Rajeeya and others, made a combined use in their works of Prarasara and Jaimini Schools of thought. Vemulawada Bhima Kavi in his Jyothisha Amruiha Sara exclusively adopted the Parasara tradition and predicted results from janma-lagna. None of these authors refer to Sripati-Varahamihira School of thought in their works. After several years of toil in securing and studying the works of the three schools of thought available in Telugu, Tamil and the published works in North India, Sri Vadrevu Sunjanarauana Murty garu ventured to present what seemed to be the merits and defects of the three schools through the study of thousands of horoscopes. A careful study of the three schools of thought spells specific superiority of the Parasara school of thought. This superiority can be seen in two aspects, namely Ayurdaya (i.e., longevity) and Yoga (i.e., life status) sciences. Ayurdaya is an essential criterion for every person, and without it, all considerations of Yoga are futile. Sage Parasara attributed the Lordship of Ayusthana to Lagnadhipati. Even if Lagnadhipati is the lord of anyone of the twelve aspects also, then the Lagnadhipaiqa is more powerful in consideration of longevity and it is scarcely necessary to add that the lord of Ayusthan is the lord of Maralaz also. (3) For Knlatra (Spouse), both Lagna House and 7th House are accountable. 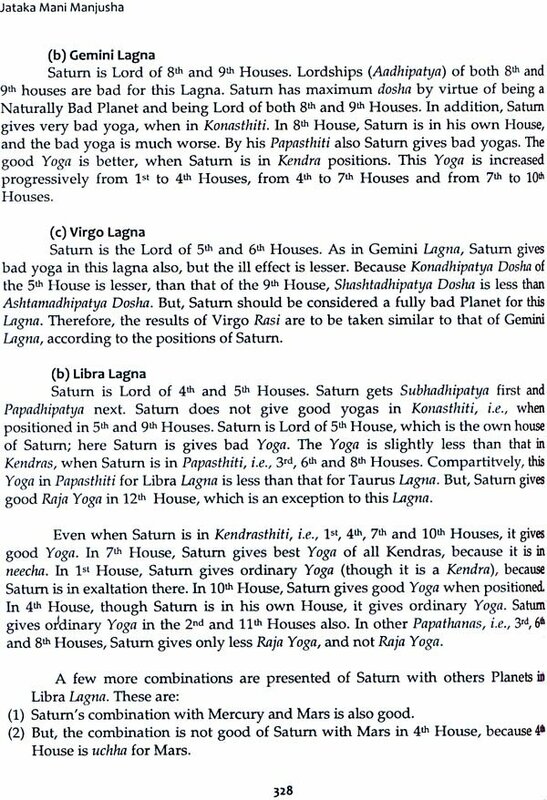 For the above reasons, Sage Jaimini's rules have been omitted in the book by Sri Suryanarayana Murty garu regarding Ayurbhuva and only rules applicable to Yoga (Status) are included. For Yoga Bhaga, not only good and bad of life, but its prenatal and post-mortem states have been included. Thus, it excludes all other aspects expect Ayurdaya. The book by Sri Surfanarauana Murty [Murty, 1949] includes Raja Yoga and its modifications, the aspect of martial happiness being basis for family life and then the predictions about the past and future lives. On these questions, the three schools have held varying opinions. In Parasara School of Astrology, the 12 Bhavas are assigned in sequence, commencing from Janma Lagna (rising sun at birth). In this school, except Janma Lagna, all other Lagnas have been given equal importance and the division into chapters coincides with the division into Bhavas. Whereas Sage Jaimini grouped all the relevant considerations for Yoga and Ayurdaya separately, Sage Varahamihira adopted the above grouping in his Brihathiathaka. He commenced with Janmakaladhiputa - study of birth sign, goes on to Balarishia and Ayurdaya, and only then goes to Yoga study in Karma Jeevadhyaya and Rajayogadhyaya. Sage Varahanuhira had not discussed separately the Matru, Pitru, Bhratru and Kalaira aspects at all. But Sage Jaimini examined these aspects by Karakamsa and Arudha Lagnas, and Life and Children by Upapada. Sri Suryanarayana Murty garu after exhaustive study of opinions on the subject, laid down by various Rishis, brought out astrological conclusions for the twelve Bhavas and incorporated in his book Jataka Narayaneeyanm printed in 1933. The slokas and their meanings of 257 number of Sutras contained in Jaimini Jataka Phnla Adhyayanz were included in a summarized way in the same book. The diseases and Karaka Grahas for each one of them were added therein as an Appendix. Sri Suryanarayana Murty garu trusted that this work would help both students as well as scholars in applying these Yogas in practical life in obtaining accurate readings. Sri Suruanarayana Murty garu stated that Sage Parasara only mentioned that the natural character of planets change due to lordship. But, he did not state how this changed character by virtue of position of planets undergo further change either to come back to their original character or sometimes retain their changed character to give good or bad Yogas. Sri Sunjanarasjana Murty garu stated that he completed this shortfall while describing the Yogas of planets and combinations of planets for various Lagnas. Sri Survanarajana Murty garu added in his book the Sampradayas, which came as family traditions along with his personal experience gained from examining thousands of horoscopes. In line with Sampradayas and personal experiences, he quoted many examples in his second book titled Yogavali Khandamu. This book is divided into four parts, namely Yogavali Khandamu (with 31 slokas), Balarishia Khandamu, Aayurdaya Khandamu (with 6 slokas) and Misraphala Khandamu (with 40 slokas). The 37 slokas of Sage Parasara contains 6 slokas pertaining to Aayurdaya Khandamu have been separated and explained and the remaining 31 slokas had been described in Yogavali Khandamu. Balarishia Khandamu was written first as a special chapter before taking up Aayurdaya Khandamu in line with Sampradayas. In Balaarishia Khandamu, only the principles were mentioned as laid down by Maharishis in their schools of thought and those given by Varahamihira. This chapter contains many Yogas and principles, in addition to what were given in the chapter on Balaarishiamu in Jatoka Narayaneeyamu. New and additional information were given in the chapter on Aayurdayamu. Some of the 40 slokas of Jataka Chandrika added by Sri Venkateswara Daivagna garu were included as a separate chapter titled Misraphala Khandamu, because they were clearly explained and understood. This book is over rated and over charged. It had more charts than anything with minimal detail of the meanings of those charts. 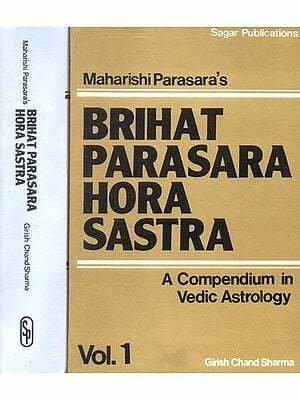 Only part that seemed consistent with Parashara's teaching is the portion on Medical Astrology. Other than that dont waste you time or funds.